Summary: This blog post showcases nine different digital tools and links to related resources useful for engaging students and/or teachers in sharing stories or other work through a variety of media and to a variety of audiences. Thoughtful use of digital tools enables both students and teachers to be “active creators of content.” This entire post and the linked resources could be used in professional development offerings focused on digital learning. Editor’s Note: Teaching Channel has partnered with Student Achievement Partners on a blog series about digital literacy tools and their effective use by educators. The majority of the tools mentioned in this post and the four earlier posts in our series, transform the student experience from passive consumers of information to active creators of content, employing multiple English Language Arts standards and skills along the way. We firmly believe this ought to be the new norm in the modern classroom. Kids have access to information; we must teach them how to navigate a world constantly evolving where content is at their fingertips. The traditional application of ELA isn’t enough for future-ready learners. We would argue our students read and write more now than they ever have before—between texting, social media, gaming, and everything else they do in their digitally fueled, online lives. Our vision must evolve to incorporate a new approach to literacy instruction, one in which technology becomes an accelerator to personalize and create meaningful learning contexts. In this digital age, storytelling, comprehension, and the writing process are evolving before our eyes. Schools, then, must recognize and value the fact that a narrative doesn’t always have to be told with pencil and paper, or that the steps of the writing process aren’t bound by tradition. In this final installment of our series, we focus on speaking and listening. The Common Core State Standards (CCSS) stress the importance of communication, and challenge students to engage in conversation by using evidence to support an argument, while evaluating and listening to others’ perspectives. The nine tools below create opportunities for students to employ their speaking and listening skills as creators and producers, and as called for by the CCSS. BookTrack is an awesome, free tool that enhances both reading and writing by incorporating music. Students can create soundtracks for plays, poems, stories, or even their own creative writing, and share their creations with the world. Text and music both have the powerful ability to elicit an emotional reaction from the audience. With BookTrack, students can merge the two and bring a new dimension to the written word. As English teacher Kate Baker explains, “BookTrack is the only tool that I’ve found that really helps students connect with author’s purpose and tone in writing.” Enhancing the text with music calls for students to think deeply and critically about the written word, and encourages them to create an experience for the reader. Children have to consider the audience; mood and tone of both the text and music; author’s purpose; and employ digital editing and revising skills to create the soundtrack. We’re all familiar with the writing process, but do we ever stop to consider how that process is mirrored when children create and edit video and audio? We ask students to revise, edit, and publish in classroom tasks which imply these skills are the end goal, rather than a means to an end. We rarely give the process, as a whole, meaningful context. Composing with BookTrack provides an avenue for children to progress through to a final product in the creation process. VideoNot.es is a platform that allows students to take notes synchronized with video. In other words, students can be viewing a video on half their screen while simultaneously taking notes on the other half. This is an innovative way to help students engage deeply with a text, as called for by the Standards. The most amazing aspect to VideoNot.es is that each note is automatically synchronized with the video (think time-stamped). When students go back to review the notes they took, all they have to do is click on a line they typed and the video jumps to that specific point. VideoNot.es isn’t simply limited to YouTube either (though it does work seamlessly there); Khan, Vimeo, and several MOOC (Massive Open Online Course) platforms work as well. Additionally, the tool connects with a person’s Google Drive account, so it’s perfect for Google Apps For Education districts around the world. Several uses exist for the tool, but teachers may find great value with VideoNot.es as part of a flipped learning model. Teachers can assign a video and ask students to take notes on its content. Additionally, teachers may ask students to jot down questions, connections, wonderings, wow/a-ha moments, etc. Students can then either share their notes with the teacher as a vehicle for personalized feedback, or with peers as part of structured opportunities for collaboration and dialogue. The tool encourages students to not simply listen to the content, but also to employ visual and oral comprehension strategies, along with writing processes. EduCanon and Edpuzzle are two of our favorite tools that allow teachers to create interactive videos. Teachers can record a screencast or leverage existing videos, and embed questions at strategic points in a video to monitor comprehension and/or push a student’s thinking. Teachers can differentiate content and questioning and promote self-paced learning. Additionally, by embedding formative assessment checks throughout the video and analyzing real time data based on student response, teachers can provide precise intervention or enrichment along with timely and specific feedback. Teachers can use this tool as part of a flipped or blended learning model to provide self-paced learning opportunities. Videos can be taken from YouTube or teachers can utilize their own creations. Don’t think of it as just a teacher tool; encourage students to create their own flipped videos with questions. Speaking and Listening Standards can be supported by the creation of podcasts in the classroom. Students can practice fluency, produce book reviews, record a solo on their instrument, or reflect on assignments, to name a few possible podcasting activities. How often do students have the opportunity to listen to their own speech? Or process content and then be able to articulate the material in a way that is meaningful to them? There are many ways educators can begin to implement podcasting, or digital voice recording, as part of their classroom practice. Teachers and students could begin using Google Voice to leave voicemail messages for one another. We’ve found this strategy to be very effective in helping students develop all six dimensions of fluency when acquiring a new language. Additionally, web-based platforms such as Vocaroo afford similar opportunities to record audio. With this tool, students can download their recording, link to a QR code, or share via email and social networks. Students can also use programs like Spreaker or Audacity to add music and sound effects. The spectrum of podcast creations can be as basic or as “fancified” as a student would like it to be. As we mentioned in an earlier post in this series, empower student voice by providing an audience. Student podcasts can be catalogued and utilized by fellow classmates to reinforce concepts. Beyond that, the CCSS and Next Generation Science Standards (NGSS) bring uniformity and consistency in terms of grade-level expectations. Consider posting podcasts on websites, blogs, or social media so students can share their work with others around the world! ThingLink is a phenomenal tool that takes storytelling to a whole new level: an image or video becomes the canvas for students to create interactive media. Students start with an image as the foundation and add links to videos, content, audio, maps, and additional images to construct a multimodal story. ThingLink contains interactive hotspots for viewers to click to explore more around a given topic. Asking students to create using ThingLink provides them an opportunity to employ comprehension, writing, and listening skills in a virtual context. Students must strategically select and embed elements that help facilitate their story. Perhaps it’s a map that becomes interactive with content related to a series of battles, or the area’s history of colonization, coupled with music and art of a particular era. Maybe students researching an author are able to embed tidbits of information about that author’s life and writing. Teachers can even use this tool as a way to organize resources for units by providing an interactive experience through an image or video. 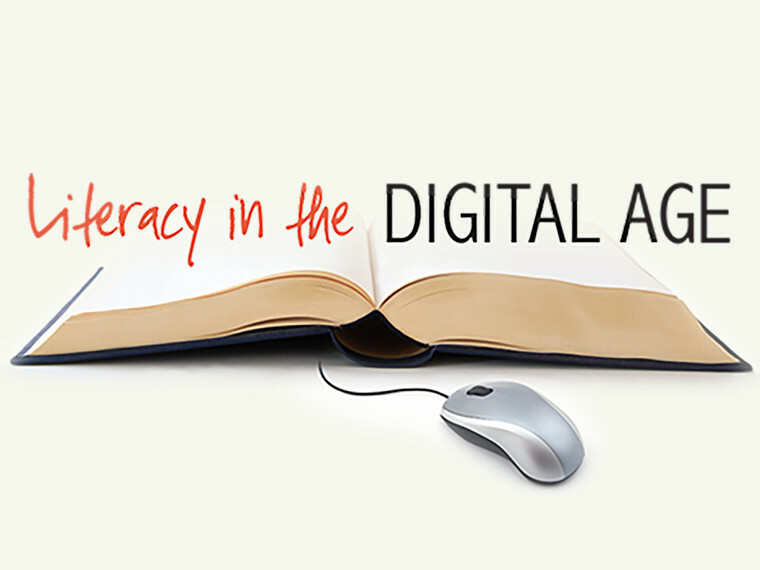 Our Literacy in the Digital Age series is a call for educators to leverage digital tools to empower students and transform teaching and learning—in your classroom and THEIR world. Let us know if you try out these or any of the other tools mentioned in the series via the comments below. Or reach out to us on Twitter to share your story: @NatalieFranzi and @SteveFigurelli. And finally, don’t forget to join our class on Remind to continue the learning. Text @4TCHrs to 81010 from your mobile device to join Digital Tools for TCHrs, and receive notifications about a new digital tool every week during the school year.